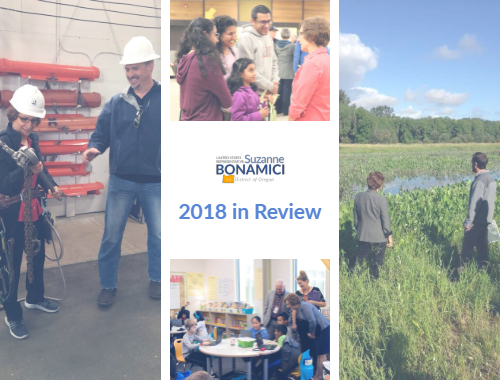 As we reflect on 2018 and look ahead to the start of a new Congress in 2019, I’m grateful to everyone across NW Oregon who contacted me about issues of concern. This year my office received and replied to 74,623 letters and phone calls. 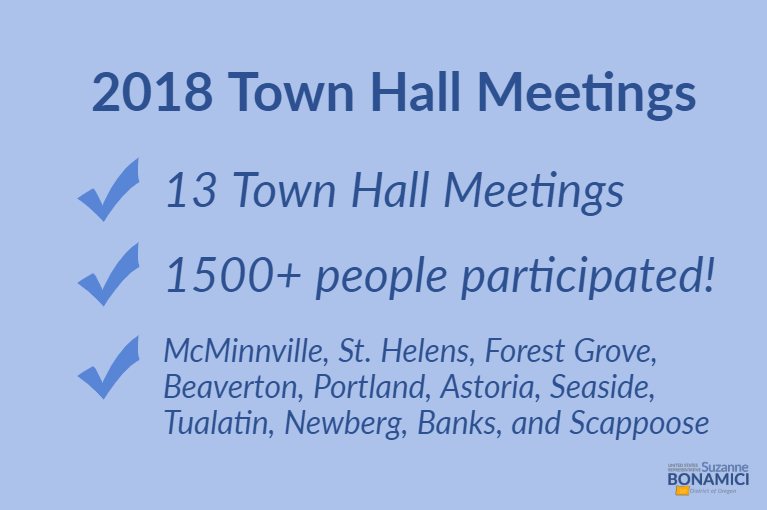 I also held 13 town hall meetings across NW Oregon; 12 in person and one by telephone to make it accessible to more people. My office assisted more than 1,000 people with questions and challenges involving federal agencies, including the VA, Social Security, and immigration. One of the cases was for the Nguyen family, who were reunited this fall after being separated for more than 40 years because of our broken immigration system. 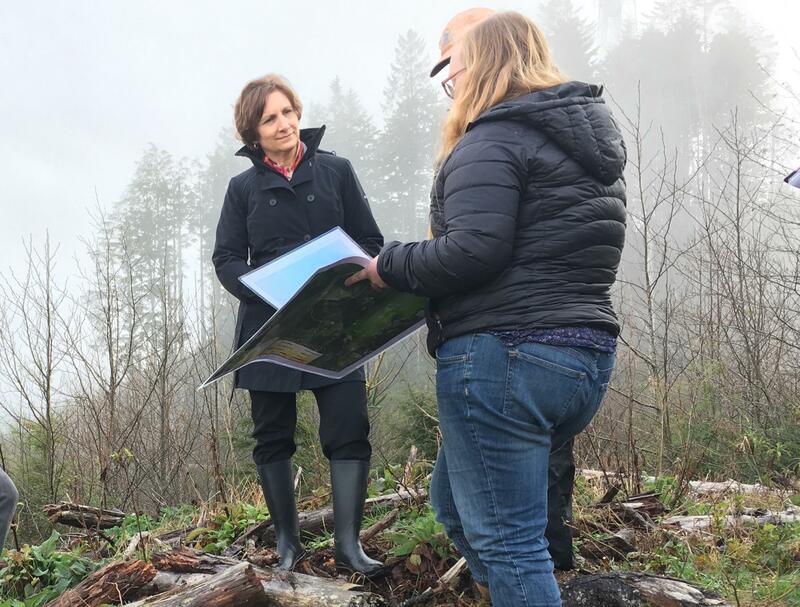 Climate change continues to be a pressing concern for Oregonians as we witness more extreme weather events, catastrophic wildfires, and changes to the ocean’s chemistry. I’ve been raising awareness by sharing climate facts on Twitter, and will continue to work with my colleagues to develop and implement lasting legislative solutions. Another urgent challenge our country faced this year was the Administration’s abhorrent policy of separating parents and children at the border. I visited imprisoned detainees in Oregon, spoke out on their behalf, and called on Secretary Azar to reunite families. Tragically, gun violence also continues to plague our country, taking 17 innocent lives at Marjory Stoneman Douglas High School in Florida, killing 11 worshippers at a Pittsburgh synagogue, and ending the lives of 90 Americans every day. These are serious challenges that I am committed to addressing when a new Congress convenes in January. The year began with yet another misguided attempt to repeal the Affordable Care Act. The thousands of people who spoke out in support the law helped us to defeat the repeal effort, and the Affordable Care Act still stands. There is still much we can do to make sure everyone has access to affordable, quality health care. I am proud to be a member of the Medicare for All Caucus, where we will be debating options for increasing access while reducing costs. One step in the right direction was the passage of my bipartisan bill to address the nursing shortage across the country. Another was the opening of the new Virginia Garcia Health Center in Beaverton, which will make our community stronger and healthier. At the beginning of this year I completed an in-depth look at the opioid crisis in NW Oregon and issued a report summarizing my recommendations, including my solution to increase disposal options for unused medications. As I prepare for a new session of Congress, combating the opioid crisis will continue to be a top priority. This year I stood firm against the harmful proposals of Education Secretary DeVos and the Trump Administration. When DeVos finally appeared before the Education Committee, I asked serious questions about the importance of public education. I spoke out on behalf of transgender students facing attacks on their civil rights, student loan borrowers who DeVos made more vulnerable to deceptive practices of unscrupulous private lenders, and survivors of campus sexual assault who deserve to be heard and believed. Talking with young people is one of the best parts of my job, and this year I heard from students at 24 schools across Oregon. McMinnville High School students shared their fears about gun violence, kindergarteners at Minter Bridge Elementary sang to me in English and Spanish, and students at Banks High School demonstrated their robotics creations. I was thrilled to update the federal career and technical education law to strengthen programs that are helping students stay in school and prepare for college and careers. All seniors deserve to retire with dignity and financial security, but unfortunately too many face financial hardship as they age. As a leader of the Congressional bipartisan Elder Justice Caucus, I am fighting to secure funding for initiatives that help victims of fraud, hold cheaters accountable, and recover stolen money for our seniors. If you’re retired, saving for retirement, or caring for an elderly family member, my office is here to help. I’m also co-sponsoring the Retirement Savings Lost and Found Act to help reunite workers with retirement savings they may have left behind at past jobs. And as your representative, I will always work to protect and strengthen Social Security and Medicare. The Trump Administration continues to attack laws and regulations designed to protect the environment. At every step I’ve called out the Administration for its failure to protect natural places, clean air, and clean water, and for failing to fulfill the Environmental Protection Agency’s mission of protecting public health and the environment. I’ve called for immediate action to slow greenhouse gas emissions and mitigate the effects of climate change. As co-chair of the House Oceans Caucus, I was proud to pass the Save Our Seas Act to help get plastics and trash out of the ocean. I also helped secure $105 million for wave energy research, a technology that promises to increase our renewable energy options and help us move toward a clean energy future. As a diverse and vibrant new majority prepares to govern in the US House, I’m committed to working on the issues that matter most to Oregonians. I’ll strive to increase access to affordable health care for all, lower the cost of prescription drugs, make debt-free higher education a possibility for any college-bound student, and take meaningful action to combat climate change. The new majority has also made infrastructure a priority, and it’s one I strongly support. I’m hopeful that the House can pass a robust infrastructure funding package to help rebuild and repair roads, bridges, ports, railways, public buildings, and the electric grid. In that discussion, we must include water infrastructure projects like the Willamette Water Supply System. I was proud to help secure $616 million for this project, which will provide a sustainable source of clean water to thousands of people in Washington County. Investing in infrastructure projects like this is a win-win for our communities.